A new plan for railroad service on the East Coast includes an Amtrak stop at Philadelphia International Airport and improvements that could help the region's railroads run faster and more reliably. The NEC Future project, announced Friday by the Federal Railroad Administration, would also straighten the Frankford Curve, north of 30th Street Station, where an Amtrak train derailed in May 2015, killing eight people. The Federal Railroad Administration released recommended improvements to Amtrak's Northeast Corridor Service that would create two new stations in the Philadelphia area, including one at Philadelphia International Airport, and add additional track for more frequent Amtrak and SEPTA service. The curve at Frankford Junction, the scene of the deadly 2015 Amtrak derailment, would be among the sections of track that would be straightened to allow for faster speeds. If adopted, the proposed changes throughout the Northeast Corridor would cut 35 minutes off the travel time between New York and Washington. A trip from Philadelphia to Washington would take an hour and 20 minutes, 20 minutes less than today. Getting to New York City would take 55 minutes, 15 fewer than now. The recommendations -- part of a $120 billion, 30-year plan for the 457-mile Northeast Corridor -- were four years in the making, and would bring more goodies from Boston to Washington: a long-awaited rail tunnel expansion under the Hudson River, Amtrak service between New Haven, Conn., and Springfield, Mass., and faster, more frequent trains between the East Coast's metro areas. Experts called the plan groundbreaking, marking the first time the FRA had offered a unified vision across the eight states served by the nation's most heavily traveled rail corridor. "There's no doubt this is the first time anything of this scope has been done," said Bruce Becker, vice president of operations for the National Association of Railroad Passengers. "It is the first time there's been a global approach." Andrew Bata, North American regional manager for UITP, an international railroad trade group, said the plan took East Coast rail a step closer to the kind of high-speed service common in Europe. "It's about time we think globally for high speed or fast train service in the U.S.," he said. "We are way behind the world." But whether the proposal becomes reality depends on states' willingness to invest and especially on funds that an incoming Trump administration decides to devote to rail. Some observers say the giant project could become a rare point of agreement between Republicans and Democrats, but early reactions were muted Friday. The FRA estimated its recommendations could create 47,000 jobs a year for the next 30 years. Almost a third of the $120 billion price tag would go toward bringing the corridor into a state of good repair. In the Philadelphia area, the FRA proposals would increase intercity rail travel to about five million one-way trips a year, though that in part would be caused by population growth over the next 30 years. "While building this recommendation would require significant investment," said Transportation Secretary Anthony Foxx in a statement, "the cost of doing nothing is much greater." Gov. Wolf supports the proposal's goals of improving rail travel, but acknowledged that money would be hard to come by. "Given the tremendous cost of any such proposal," Jeff Sheridan, the governor's spokesman, said in an email, "we would be eager to see the federal government make the investment in infrastructure necessary to make them a reality." This fiscal year, federal spending on passenger rail was about $1.4 billion, according to the House Transportation Committee. The FRA proposal would require an annual commitment of $4 billion to East Coast rail alone. The head of that committee, U.S. Rep. Bill Shuster (R., Pa.), called keeping rails in a state of good repair and planning for growth a priority, but declined to address any of the specifics in the FRA proposal. "I look forward to learning more about the options outlined in the NEC Future plan," Shuster said by email. Rep. Brendan Boyle (D., Pa.), a member of a House transportation subcommittee, sees the potential, though, for a big infrastructure spending bill that could make the FRA proposals a reality. "If I had to pick the one single area that has potential for cooperation, it would be infrastructure and transportation," he said. President-elect Donald Trump has proposed a $1 trillion infrastructure package, but has met resistance from fellow Republicans, including Senate Majority Leader Mitch McConnell. The FRA proposal is intended to be an overall vision and does not predict how the proposed improvement would change ridership or revenue at specific locations. If states choose to pursue the FRA recommendations, more studies would be needed before any work could begin. "We have to have something that meets the demand of the growth that is going to come, but also something that is aspirational but also achievable," said Matt Lehner, an FRA spokesman. There are no estimates about exactly how many people would use Amtrak service to the airport, but a spokeswoman said airport officials welcomed the idea. "It certainly would connect us more up and down the East Coast, and that would be wonderful," said Mary Flannery, the airport's spokeswoman. The FRA proposal would increase the number of trains arriving and departing from PHL each day from 72 to 332, and would create direct rail access for fliers from Delaware and New Jersey, potentially increasing those using an airport already serving about 86,000 fliers daily. The only rail service to the airport is SEPTA's Airport Line from 30th Street Station, which moves about 7,150 people daily. The FRA recommendations would make a four-track right of way standard throughout the Northeast Corridor, a move Amtrak said would be critical to resolving the tug-of-war that now exists, as different types of rail service all compete on the same tracks. In Philadelphia, slower SEPTA trains that make frequent stops are in some places traveling on the same track as Amtrak trains moving at more than 100 mph. With four tracks, trains from different rail services would have a better chance of staying out of each others' way. Amtrak currently spends about $300 million a year on keeping its Northeast Corridor tracks in good repair, but the need is between $700 million and $900 million, officials said. The FRA recommendations would significantly increase the money available to pay for things like new signals and replacing the power wires above trains. The wires, or catenary, from Washington to New York largely date from the 1930s. "The FRA study here confirms what Amtrak has long been saying: In order for the railroad to serve the public the way it does today, we've got to dramatically increase the funding to maintain the state of good repair," said Stephen Gardner, executive vice president for Amtrak's infrastructure and investment development. Officials from SEPTA anticipated benefiting from the changes even as they acknowledged an Amtrak route to the airport could draw away riders now using their service. SEPTA lines such as Wilmington/Newark, Paoli/Thorndale, and Trenton run on Amtrak-owned rail. "Then we get the benefits and we might be able to provide better on-time performance," said Byron Comati, SEPTA's director of strategic planning. The FRA arrived at the final plan after reviewing three distinct options. Some of the most ambitious ideas, like a Center City Amtrak station, didn't make the final cut. 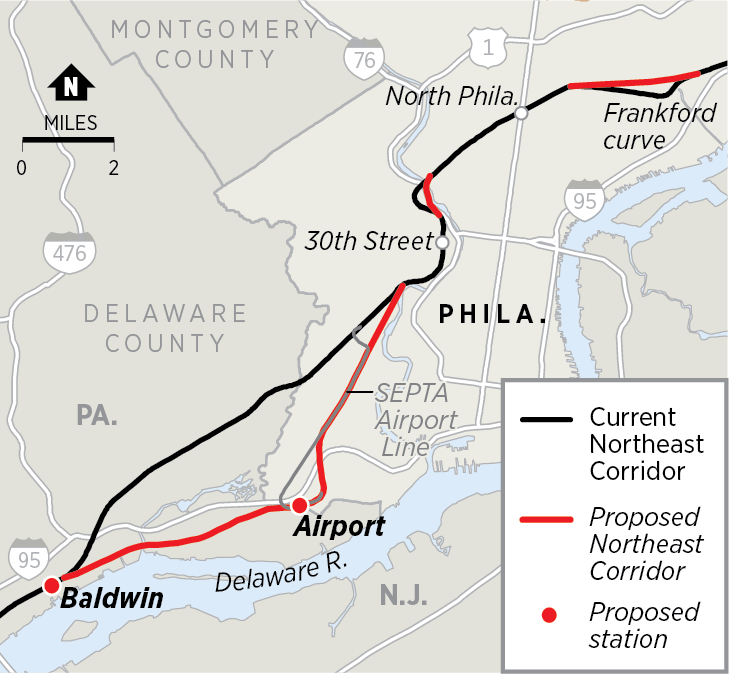 The FRA proposal suggested the airport station be underground, and also suggested a tunnel for tracks between the North Philadelphia and Bridesburg stations. While the proposal largely adheres to existing rights of way, there would be some alignment shifts near the Philadelphia Zoo and the John Heinz National Wildlife Refuge at Tinicum. The final proposal moved tracks closer to existing CSX freight rail after an earlier draft raised concerns about environmental impact at the refuge. The final proposal also includes another expansion from the airport to the Eddystone station in Delaware County, and improvements for 30th Street and Cornwells Heights stations.